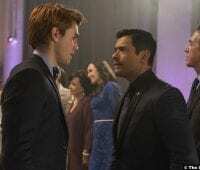 Riverdale S02E20 Review: Shadow of a Doubt -Hiram's creating chaos! I mean, he took out the Sugar Man, but why Midge? Why the attempts on Fred or Moose? Basically, if he wants to take out someone who is causing real harm to the town, why hasn’t he gone after Hiram? While I meditate on that, it’s time for the mayoral debate as the campaigns heat up. Archie has been going door-to-door stumping for his dad, which Hiram doesn’t understand. 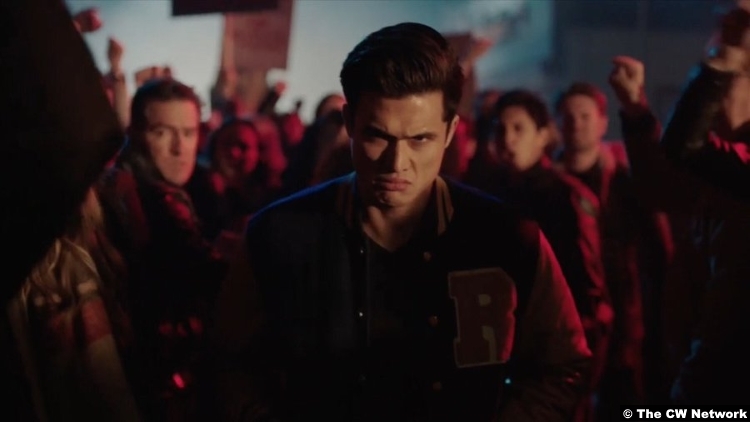 Archie explains that since he saw the Black Hood’s eyes, he’s really taking the opportunity to look every man in Riverdale in the face. Meanwhile, Jughead’s got his own issues. Trying to tell the Serpents at school that the Ghoulies are being released from jail and will be coming after them, he’s interrupted by the rebooted Dark Circle. It seems that Moose has confessed to them that he and Midge were bickering the night of her death because she had secretly been seeing a Serpent. 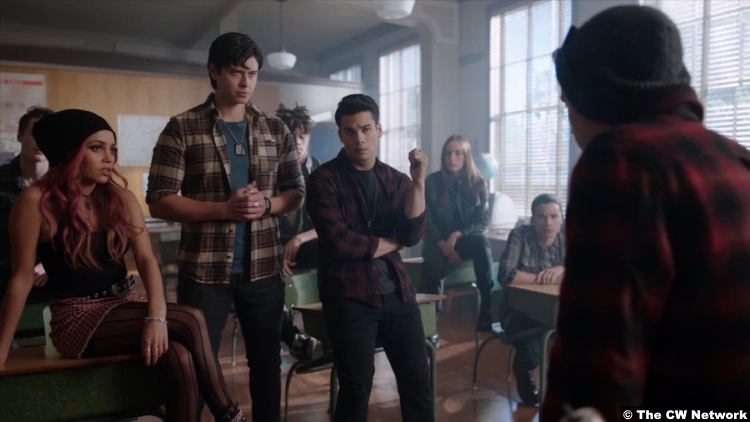 Nothing much comes from this confrontation, but it’s not hard to figure out which Serpent it was–Jughead got it on tape. That documentary footage he was shooting (and has since turned in to the sheriff’s office) caught Fangs in Midge’s dressing room. Jughead tries to get the tape back from the new sheriff, Michael Minetta (), but it mysteriously leaks to the Register’s website before he can do so. When the sheriff and deputies come for Fangs at school, he resists and drops a switchblade. It ain’t lookin’ good for Fangs, but I don’t believe he killed Midge and then staged that display. Nevertheless, that plus bankrolling from Hiram gives the Dark Circle a good excuse to cause mayhem on the South Side. With her boyfriend otherwise occupied–and laughing when she tentatively suggests that her dad could be the Black Hood–Betty turns to Cheryl for help. She’s not the slightest bit interested in being Nancy Drew and is like, call the police. Betty, however, would like to gather some actual evidence first. To that end, they go to the ShareBNB that Hal had been renting during the separation because he’s still paying on it. And speaking of Nancy Drew, they find the very same code book that Black Hood used to send Betty messages. So Betty confronts her father over the weirdest family meal I’ve seen in a long time. She talks about her darkness, which is whatever. But her parents are strangely chill over the fact that she’s been phone friends with a serial killer to whom she led Chic. Her dad says the Nancy Drew book was a birthday present for her and he had no idea about its connection to the Black Hood. Actually, as we come to the debate itself, everyone has been strangely chill about the whole Black Hood thing. Maybe it’s because I’m still thinking about the Golden State Killer, but communities tend to get a little more freaked out about these things. They hold community meetings and form watch groups. A little bit of that has been done here, but they have goldfish memories. I mean, I wouldn’t head out to a public debate so soon after the Midge incident, but go off, I guess. The debate is pretty standard. Hermione scores points with the fact that Fred isn’t aware of the “dangerous, radical” Dark Circle at all, even the fact that his own son founded the group. A smart person would slip Fred a note at this point about Hermione’s husband funding the group, but Fred has Archie. Veronica seems to be mostly tuning out the debate, but a flash of light in the balcony catches her eye. It’s the Black Hood with a gun. As he strafes the audience, we see Hal with Betty, so either Hal’s not the Black Hood or there’s more than one. Despite the show of firepower, the Black Hood is either a terrible shot or wasn’t actually trying to hit anyone, because it doesn’t look like anyone’s actually hurt. Hmm. Creating chaos is a Hiram Lodge tool. In the aftermath of the shooting, he cares so little about Hermione’s visible fear that a disgusted Veronica switches sides to Fred’s campaign. (By the way, that’s great optics and all, but y’all know you’re too young to vote, right?) If this Black Hood were a Hiram plant, that doesn’t discount Hal as the real one. It doesn’t rule out Fangs as Midge’s killer, either, but c’mon. 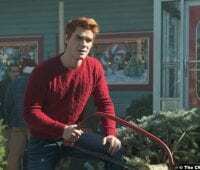 So while Betty’s on my wavelength, calling her dad to meet at her Town Hall to finish their Black Hood conversation, the townspeople of Riverdale, riled up by the Dark Circle, are outside the police station. What, do they think Fangs astrally projected himself and shot up the debate audience? It doesn’t make a lot of sense. Like, maybe they think he killed Midge, but…SOMEONE DEFINITELY ELSE JUST SHOT AT YOU. And speaking of guns, there’s a reason why you don’t point ’em at someone unless you’re prepared to shoot that person. That’s because there’s always a possibility that something will go awry. Unlike me, though, Reggie obviously didn’t grow up thinking that everyone’s home had a reloading room, because he shows up at the town riot with a gun. 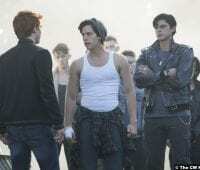 Archie tries to take it away from him, and in the struggle, Fangs takes a bullet to the chest. Something will go awry. Meanwhile, Hal never shows up to meet Betty. 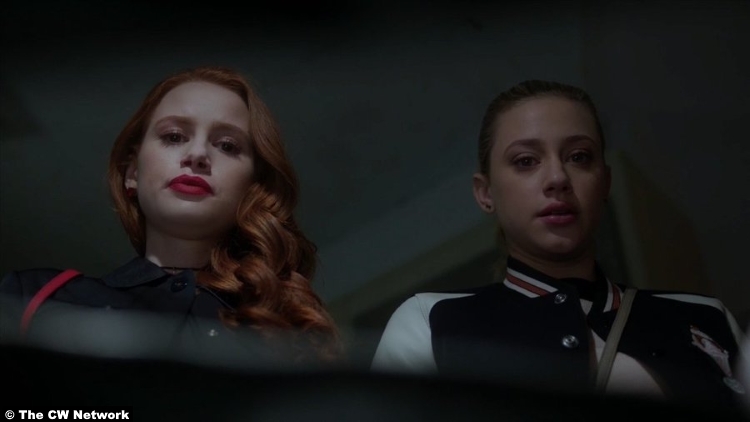 But the Black Hood comes for Cheryl. And again I ask, why these people? 8/10 – You might be thinking, But Salome, you didn’t mention the casino plotline. Yes. I didn’t. 😉 I mean, in the face of everything else going on, I couldn’t rub two cares together about a teenager thinking she’s going to start a casino. But if you do, there’s your mention. Anyway, the show very definitely wants us to think that Hal is the Black Hood and I think they’ve wanted that the entire time. It still doesn’t make a lot of sense, though. 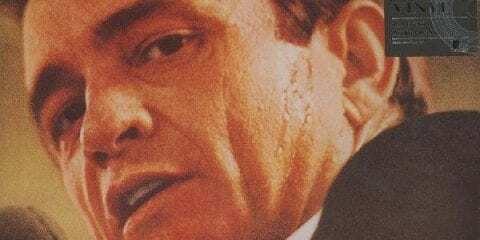 I know that Hal has the means and opportunity–though I’m not that sold on motive–but there’s the physicality issue. Y’all know how I feel about Archie’s…simplicity, but I think even he could recognize a man he’s lived beside his entire life. (My brain: But what about that time he didn’t know Josie’s name was actually Josephine?) So if the Black Hood at the debate isn’t a Hiram plant, then he could be Hal’s partner. So who’s that? Also, come for Cheryl, Black Hood. I will END YOU. *I swear, I levitated a few feet when this name was revealed.